Disclosure: I am an official ambassador for Dole Fresh. I received compensation by Dole in exchange for my honest opinion. You may have noticed that this year is quite the big year for Disney’s Mickey Mouse, because it’s his 90th anniversary! To celebrate the “True Original”, Dole has introduced a new line of DOLE® fruits and vegetables featuring Mickey Mouse throughout the decades, along with 19 recipes inspired by Mickey Mouse. This Dole collaboration with Disney is the latest initiative in Dole’s yearlong “Powering the Hero Within” campaign, which will run until January 2019. This campaign strives to encourage families to eat healthy by creating fun Disney-inspired recipes as well as have fruits and vegetables with Disney character branding. This has definitely been a great thing for my family! When I’m grocery shopping and my 3-year-old sees Mickey on a banana or bag of salad, she’s excited to pick it out when shopping – seeing these familiar characters on fruits and veggies truly helps children discover the joys of nutritious eating! We particularly love going to Dole’s recipe page to create Disney-inspired recipes as a family. Below are some of my personal favorite Mickey Mouse recipes that you can find at Dole.com! Combine all ingredients except peanuts in blender. Cover; blend until smooth. Top smoothies with chopped peanuts, serve. You can find the Gosh Golly Gee PB & J Smoothie Remix recipe among other Mickey-inspired recipes here. You can find the full Dole Grilled “Not” Dog recipe among other Mickey Mouse-inspired Dole recipes here. Stir together yogurt and vanilla, in a small bowl. Spoon a rounded teaspoon whipped topping on each cupcake, place 2 banana dippers on each side of whipped topping and serve. You can find the Coco-Nana Birthday Cupcakes and more Mickey Mouse-inspired recipes from Dole here. My daughter and I loved recreating some of these recipes at home! They had her saying “Hot Dog!” to healthier eating! 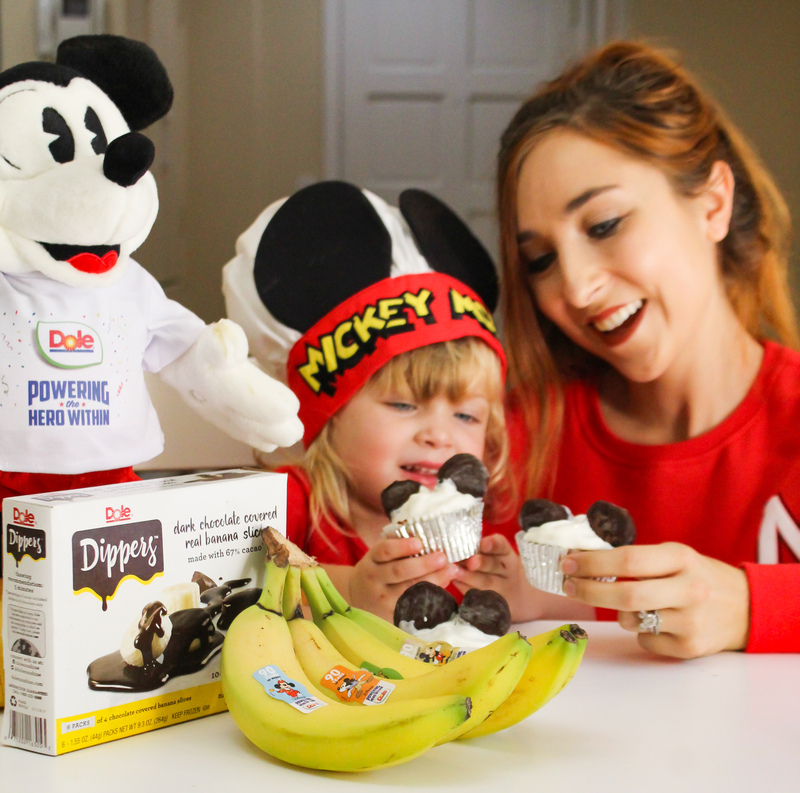 Which Mickey Mouse + Dole recipe do you want to try the most with your family?